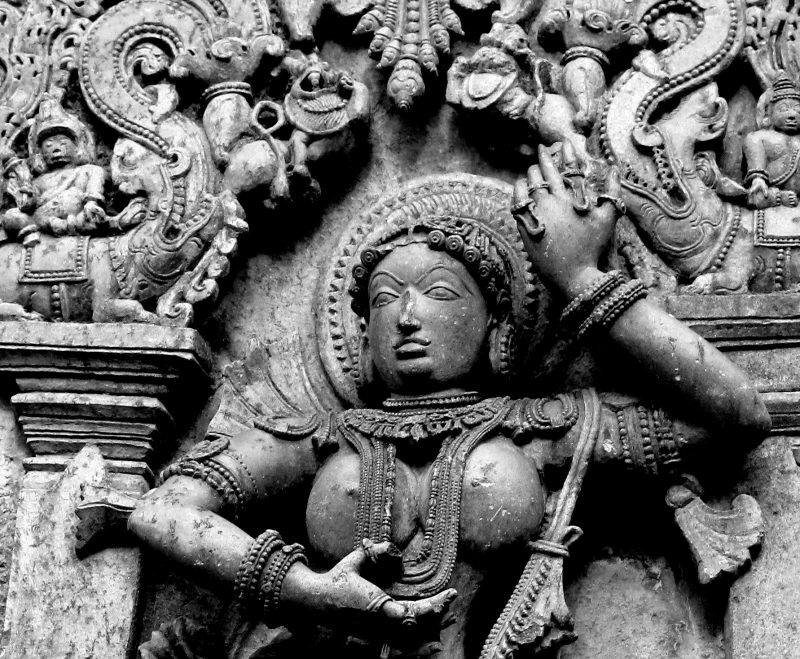 “This is the most famous sculpture of the Chennakeshava temple,” says the guide, pointing at a voluptuous dancer, etched in the ceiling of the entrance. “Shantala, King Vishnuvardhana’s main queen, built the surrounding spaces of this temple. She was a genius at mathematics and a gifted dancer and musician.” The details, as far as our eyes, shaded from the sharp sun, can see, are astoundingly minute, created patiently by a talented sculptor working with soapstone. From the folds of her jewel-encrusted mini dress, to the leaves of the flowering tree that encompass her, and the way that she stands, her hedonistic body shaped S with a Barbie-thin waist, the sculptor’s imagination is vivid and full of grace. Even though she holds a mirror, in front of her, her face is more thoughtful than vain. Shantala’s figure comes repeatedly in the world famous Belur temple, in Karnataka, one of the finest creations of the Hoysala Kingdom, built in 1117 CE. Her legends have been immortalized in a book by KV Iyer called Natyarani Shantala, which was also televised recently. The story goes that she was the talented daughter of a general in the Hoysala kingdom. She used to be such a good dancer that the Chalukya king threatened the Hoysala kingdom with a war, just to see her dance (for she would have to offer a sacred dance at the Lakshmi temple before the war). When King Vishnuvardhana first saw her dance, planned meticulously by his grandmother so he would fall for the girl and marry, he instantly fell for her. She refused the marriage, since both she and her best friend Lakshmi had danced together and she was a Jain while the king was a Vaishnava. To appease her, the king married not only her and Lakshmi, so they stay together as co-wives, but also five other girls from the same community. And he also let her keep her faith. King Vishnuvardhana made her his main queen, and she helped him in the administration of the kingdom as well as building temples around their capital city of Belur.